Welcome to the SPLRK blog. We have had many people ask us, what does SPLRK mean? Well if that is what you think, then you are wrong. On a day of inconceivable and irreconcilable boredom in math class, little grumpy nerdy Ryan was playing on his calculator and SPLRK was born. It is a exclamation such as Wow, Holy Mackerel or Geronimo! It is perfect for awkward silences. It is guaranteed to get a laugh. Try it out. If you can think of another Acronym for SPLRK, post it in the comments below. If we like it, we just may use it. While we love to keep you up to date with the SPLRK newsletters, it only comes out four times a year. To fix this predicament we are going to start doing podcasts in between the SPLRK newsletters and write in the SPLRK blog once a month. While the SPLRK newsletter is keeping you updated on the important things we are doing, it is impossible to tell you everything that God is doing in our lives. The purpose of our SPLRK blog is here so we can tell you the not so important but still good stories about what is going on in our lives. On Saturday something very momentous happened. Ryan and I returned home from a fairly arduous session of swimming. I’m tramping up the stairs to our apartment when I see a big package sitting on my doorstep. It is the package I have been waiting for ever since our wedding in July. 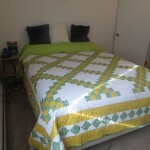 It is the quilt that my Aunt made us for our wedding. Why is this so momentous you ask? My Aunt has been fighting a brain tumor since March and has steadily been declining over the last months. She was not healthy enough to make the trip to the wedding. She didn’t have the strength to actually make the quilt. However, she was determined to get it to us. 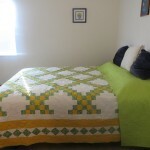 So she pieced together the quilt and had a friend actually sew it. Thank you Aunt Judy for you sacrifice and generosity.